Tempe, Ariz. [23 August, 2016] — Artesyn Embedded Technologies today announced the CPS250-M series, one of the highest density open frame power supplies in its class. Capable of delivering 250 W with forced-air cooling and 155 W with natural convection, the CPS250-M series follows the industry standard 2X4 inch form factor (50.8 X 101.6 mm) and is just 1.29 inches high (32.7 mm). The CPS250-M series offers 93 percent typical efficiency and less than 500 mW of no load power dissipation. The units offer ITE and medical (2x MOPP) safety approvals including type BF medical applications. A universal 90 to 264 Vac input and global safety approvals enable the CPS250-M series to be used almost anywhere in the world. 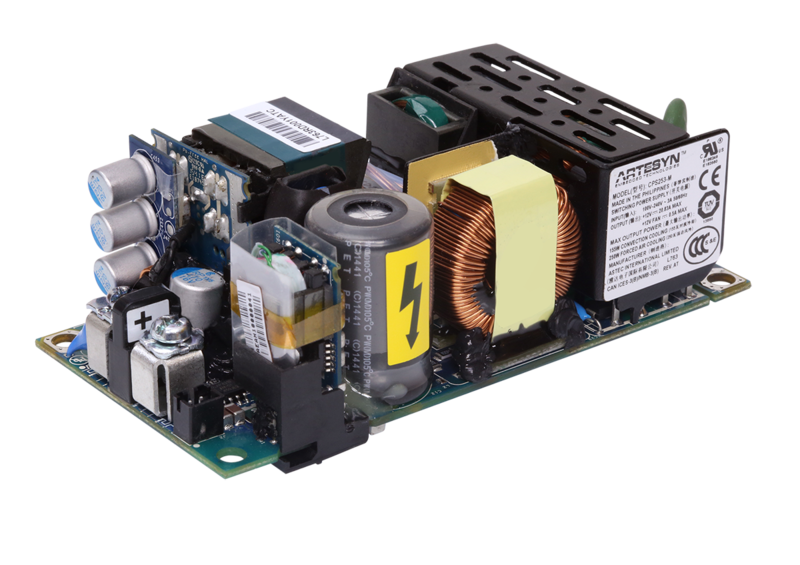 The new power supplies offer single output voltages of 12, 24 or 48 Vdc with a 10 percent trim range and additional 12 V fan output and optional 5 V standby output. Active Power Factor Correction (PFC) compliant to IEC 61000-3-2 for EMC, a built-in Class B EMI filter and compliance to edition 4 of the IEC 60601-1-2 medical EMC makes it easier to integrate the CPS250-M series into customer equipment, especially healthcare, dental, laboratory and medical applications. An optional cover kit, the LPX100, provides greater physical and electro-magnetic protection if required. The units can operate in temperatures between minus 20 up to 70 degrees Celsius with derating above 50 degrees Celsius and startup capability as low as minus 40 degrees Celsius. The CPS250-M series power supply is comprehensively protected against over load and overtemperature conditions. Artesyn offers a standard three-year warranty.